The Tacx Flux Smart Trainer came on the market in December 2016 and started arriving to US customers on December 27th. This trainer was a game changer this past fall, selling for roughly half the list price of similar direct drive trainers (discounted $709 price point during the Black Friday/Cyber Monday sales). A flag was raised on December 12th when Australian cyclist and blogger Shane Miller had an early unit (serial number ending #709) unexpectedly fail during a test ride (6:15 into video). It became more concerning when Shane reported on December 17th that his #3396 replacement unit had failed (see 7min into video) with the same symptoms (slipping belt, burning rubber smell). He had inspected the internals of the unit and had not seen any apparent manufacturing differences from first unit. This unit had be carefully prepared by the company prior to delivery. I received my early production unit in the 1st batch of units reaching US customers on 27Dec. It was a tough decision not to cancel the order given failure reports. 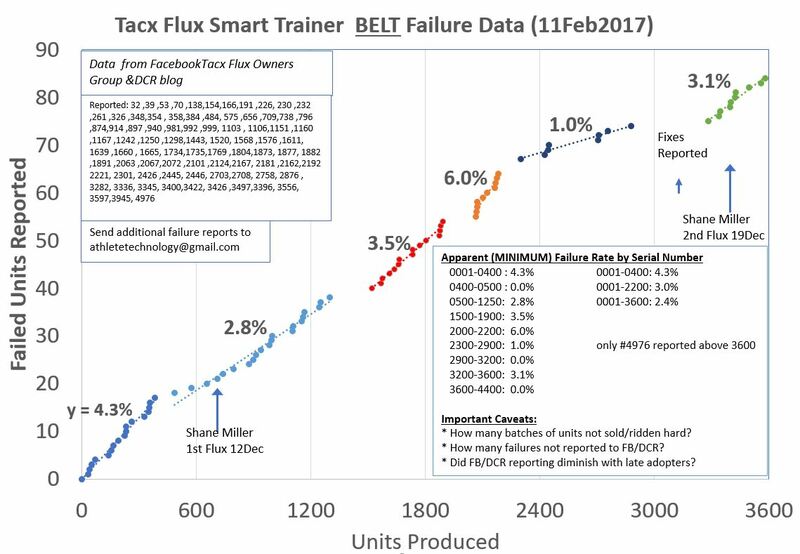 Since the launch of the FLUX (end of November) there have been some FLUX trainers with quality issues (1,7% of all produced FLUX trainers). These issues found their way back to our company through social media, influencers like Shane Miller and our support department. Questions are raised about the quality of the FLUX and some of you have concerns about your own FLUX or future FLUX. Hereby we’d like to clarify the situation and restore the confidence in the FLUX of current and potential FLUX owners. After analyzing the products with a defect that were send back to our HQ, we concluded that the problems can be brought back to two main issues. Below we explain our findings. The first issue was caused by the tensioning wheel that might be assembled too closely to the steel chassis. During a workout and especially during sprints this wheel is pushed against the steel chassis, causing internal damages and the transmission belt running of. This problem will occur within the first hours of use, if it doesn’t; your FLUX is ok. Please note this problem didn’t occur during our durability and stress tests, which was the issue with Shane’s FLUX during his sprint. After the issue was noted and resolved we made the necessary adjustments to prevent this from happening on all future FLUX products. The number of products that got into the market and might have this issue is small, the current return rate is 1,3% for this specific issue. Analyzing the second issue was a bigger challenge as it was more difficult to reproduce this incident in order to find out what caused the belt to run of the pulley wheel. This second issue also occurred with a FLUX send to Shane Miller. When sending this second FLUX we double checked every assembly step to make sure this unit was perfect. Yet, this thoroughness has led to too much tension on the EDCO freewheel hub damaging the connector between the large metal pulley wheel and EDCO body. This weak spot cracked and caused a chain reaction displacing the large metal pulley wheel and letting the tensioning belt run of. This resulted in the grinding noise and smell noted in de video of Shane Miller. In order to prevent this issue from happening, we have tested the maximum torque on all the parts and adjusted this accordingly in the production process. At the moment we only have a few cases with the same issue as Shane’s second FLUX. The vast majority of issues within this category is coming from the first issue. Besides the first and second issue we encountered some minor other incidents, but no structural problems. The current total amount of damaged FLUX trainers known to us is 1.7%, with the majority coming from the first production batch showing the first issue. We are confident that most FLUX trainers with issues from the first production batch are currently known. What can you expect from Tacx? We are very committed in solving FLUX issues as fast as possible so you can start training again. Therefor we kindly ask all FLUX users experiencing issues to send an email directly to support@tacx.com. We will take care of your problem by replacing your FLUX unit for a new one. It will be very helpful for us if you return the damaged FLUX units for analysis, as we would like to be sure that the causality of defects stays within the first and second issue. DO NOT OPEN A FLUX YOURSELF! This is very a dangerous process as high voltage runs through the electronics! Also, it can cause other problems when not reassembling it correctly, like broken magnets and electronics. Please note we can no longer guarantee warranty when you disassemble a Tacx product. But above all, please avoid dangerous situations. We would like to express our sincere apologies to all those who’ve encountered FLUX issues. We’ll do everything we can to replace your broken unit. We’ll proactively share all product issues encountered at Tacx and are as transparent as possible in doing so. My unit (#230) failed after 47 miles. Martin Smits, Business Development Manager from Tacx, subsequently shared on the DC Rainmaker blog comments that an “early unit” would be consider one with a serial number less than 1700. There are many caveats to what can be inferred from isolated reports on the internet. How many high SN units are not in field? Are gaps in reported failure due to batches not in field or due to successful production? How many field units not ridden sufficiently? How many units not ridden at high wattage? How many failures not reported to FB group? Is reporting diminishing with late adopters? Failure rates in various regions of production are noted on the plot. The reported failures run at 4.3% for 1st 500 units and then 2.6-6% for stretches under #2500. The failures appear to have persisted up to #2500 rather than the “early unit” 1700 threshold suggested by Tacx. Shane’s second failure came in a 7-unit, 2.2% failure rate stretch from #3300-3600. No belt slipping/burning smell failures have been reported since this period. Did Shane’s 2nd experience finally help resolve the issue for subsequent units? There is a 400 unit failure-free stretch prior to 3300. Tacx informed a customer with a unit in that range that it included manufacturing improvements, so one might speculate that were pulled back from distribution. Although the data hasn’t been reported and tabulated, many of the reported failures took longer than the 1 hour suggested by Tacx to occur, particularly for riders putting out less wattage. At least ninecustomers have reported 2 failed units and one customer has had 3. That could point to an inherent failure rate of around 6% or that failures are more likely with certain types of customers — those that take their units out of their boxes, ride them, and ride them at a high enough wattage to trigger failure. Over half the units have failures within 8 units of themselves. That also points to a true inherent failure rate of about 7%. Customers in EU have reported great customer service directly from Tacx and rapid direct replacements. The ocean has gotten in the way of that for international customers. Some early units remain on retailer shelves. I was driven to do the analysis above by need to decide whether to seek a replacement as well as intellectual curiosity about how much the cycling community could infer about manufacturing quality issues from crowd-sourced failure data. Given that replacements have been slow to arrive in the US as well as the unclear picture whether certain riders might be doomed to multiple failures, I opted to go with and Elite Drivo on 28Jan. I would consider a Flux for my spouse once the dust settles on this issue. Seeing the emerging picture now that issues may have finally been resolved in production after the learning from Shane’s 2nd failure, I’m tempted to second guess that decision, but for now I’ll stick with the alternative but may consider a Flux as a 2nd unit for my spouse. The picture is pretty clear for serial numbers under 3600, but not for those above. At this point the highest reported serial number in the wild is 4404. Seven people have reported working units in that range and no belt failures have been reported above 3600. Please comment below, on the FB owners group, or send an email to jackp@athletetechnology.com with your experience with those >3600 serial number units. As time goes on I’ll make edits to article and plot and comment below with chronology. Unit 3579 reported this morning, so the failure streak associated with Shane Miller’s 2nd unit continues beyond 3500. A factory tour and explanation of the problem is available at Titanium Geek. Hello My TACX flux serial no 861600224 failed (belt slipped) last year Dec 28, 2016. It failed between 1 to 2 hours of operation. I got a replacement in Feb 2017 serial no: 861605220. So far it is working good no slippage. You should be fine. Failures above serial number 3600 have been running at about 0.5% vs. 5.5% for the original batch you got. I just recently purchased a TACX Flux of the shelf of my LBS. I did not know about all the failure issues. I rode it for approx 90 minutes and experienced an awful and loud scraping sound, and smelled the rubber. My unit # is 861600160…so I assume it was on the shelf at the shop for a long time. I have contacted TACX regarding returning unit, but have not heard back yet. Hi Eric — Based on the serial number I assume you are in USA? My guess is they are likely going to refer you to your bike store for refund or replacement. Hi ! If a 861600518 run since a year should be ok, found one on craiglist no problem detected from the owner, looking info before buying, thanks !! Hi Andre — I’d be cautious and want a good discount. The failure rate for units in that period was at least 4% (who knows how many unreported). The units have a basic flaw and its just a matter of whether they were set/tensioned/adjusted to avoid the belt failure. Its not like there were inherently good or bad units. If the owner got a lot of MILES in on the unit, perhaps it is past the risk point. They don’t break gathering dust in the basement. To some extent, I’d guess its a function of the rider. Their testing methodology didn’t factor in the torque a twisting rider would put on the axis of the hub. A stronger/heavier rider might be able to break a unit that a smaller/more moderate intensity rider did OK with. I would guess that Tacx will honor warranty (and likely non-warranty) claims for this failure mode for quite some time, so as long as you are comfortable with the risk I’d go for it at a good price. I just bought an Tacx Flux with Sn. 861724459 second hand in Belgium. He is still in guarantee for a couple of months. I’m training in my garage where it is currently around 10C°. At the beginning of the training the Tacx makes some beaping sounds, I assume because the belt is cold. After a couple of minutes, this disappears. When sprinting up to 600W the Tacx makes also some beaping sound but as I can not hold this long, it disappears coming back to normal cycling. Should I worrie? Can anybody tell me, based on the serial number, if this Tacx is a 2nd generation device with all adjustments included since the launch? 8617 means it was made in 2017. The reliability of this era is much better than 8616 but can they still can have same failure mode. I imagine if it fails by the typical method they will still replace given the known issue. For belt failure, from what I’ve seen on the facebook group, it usually gets bad quickly and only goes downhill. Thanks for the reply! I will use it intensively the coming months and see how it goes… is it good to use some spray on the belt – like silicon spray? I did not read anything on maintenance. No user maintenance that I know of.